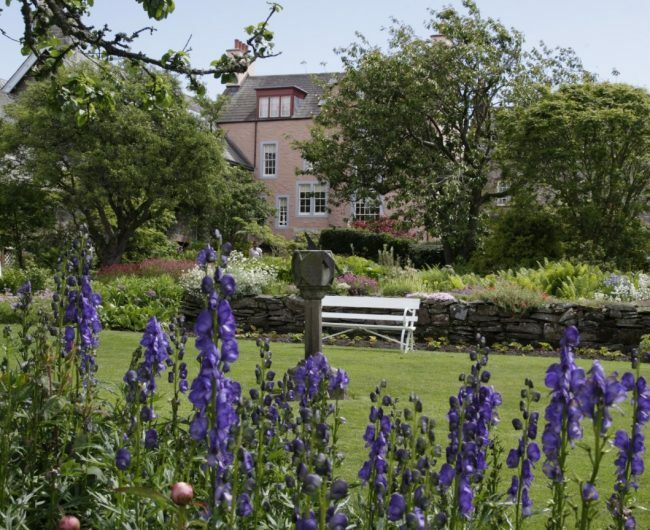 Broughton House & Garden stands in the heart of Kirkcudbright, a historic town and artists’ colony on the Galloway coast. This impressive museum, combining both original interiors and exhibition spaces, is dedicated to E A Hornel’s life and work as an artist, collector and antiquarian. Hornel – one of the early 20th-century ‘Glasgow Boys’ – bought this impressive building in 1901 and transformed it into his studio and salesroom as well as his home. Hornel was a colourist with an eye for sensual detail – many of his works hang in the house alongside those of his contemporaries. He was also an avid collector: his vast library and archive – regularly used by visiting scholars – includes one of the world’s largest collections of works by Robert Burns as well as rare documents on Galloway’s rich history. His gallery, constructed in 1910, with its ornate fireplace and Parthenon frieze (inspired by the Elgin Marbles), is one of the finest rooms in south-west Scotland. Outside, Hornel and his sister designed a beautiful garden, with sweeping views over Kirkcudbright harbour and the River Dee. This mature garden is now a gentle labyrinth of stepping stones, wisteria-covered paths and Edwardian charm.